Jungle Zoo Water Slide Combo Rentals | BounceGeeks.com Richmond, VA. Jungle Zoo is our biggest Bounce/Slide Combo! All the kids will love this new premium Jungle Zoo Combo which is a whopping 35 feet long! 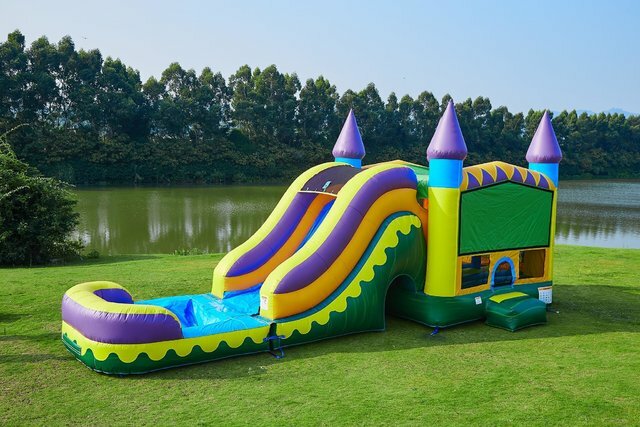 This is an awesome inflatable combo, providing a huge bouncing area, a climbing ramp, pop-up obstacles, a basketball hoop, and a tall slide. You supply the garden hose, and we attach a pool at the end to provide the kids with a sweet splash landing!